I didn’t think I’d delve into politics quite this early, but that damn Sarah Palin is at it again, and I just can’t resist. 1) I do not like her. Aside from our shared love for running, I don’t agree with her on anything, politically or ideologically. She’s more concerned with advancing her own image than with improving America, despite what her supporters say. Her ignorance of world affairs troubles me. Anytime I hear her name in the news, I cringe. But then I started thinking: FOX News is the perfect place for Sarah Palin, and her new gig there *hopefully* means she won’t run for president in 2012. The fact that she resigned as governor of Alaska with nearly half her term left proves she’s more concerned about making money and basking in the media spotlight than enacting positive policy. And she supposedly has a degree in journalism (though that doesn’t really matter at FOX). So if that’s what she wants, why not give it to her? It’s not like people who regularly watch FOX News do so for its “fair and balanced” news coverage; they want to hear someone tell them that the way they think is right. (Yes, I know that’s a blanket statement that does not apply to every single person who has ever watched FOX News. But it does describe many FOX devotees.) And the network panders to this exact tendency. She can’t really do that much damage, can she? Honestly, more opportunities the woman has to speak on national television = more opportunities for Americans to realize how unqualified she is to run for president in 2012. Or ever. Unfortunately, there is one major caveat to this: It could backfire. What if this is part of her evil, evil (so, so evil) plan to take over the country in three years? Depending on the political climate when the election rolls around, normal, non-right-wing conservative nuts might actually like what she’s saying. She could make a serious run for the presidency, and she could even (ohdeargodpleasedontletthishappen) win. In which case, I would probably shoot myself. 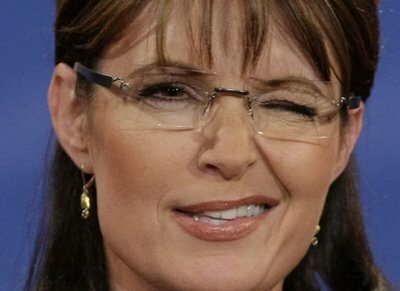 I realize I could just leave the country, but I’ve decided a world in which Sarah Palin can be elected president is a world not worth living in. Do you suppose Sarah would let me borrow her gun?